Get Your Hair Stylist License and Get Moving on Your Business! If you’re like working with people and want to help others look their best, a career as a hair stylist may be something to consider. Getting your hair stylist license and becoming a professional hair stylist can be a good way to make a living doing something you enjoy. Plus, the field is growing fast, and there are more jobs all the time! Even if you have a natural talent for hair styling, becoming a professional will require formal training. To be a professional hairdresser, you’ll need to know more than how to wash, cut, and color hair. Fortunately, there are a number of options available for how to become a licensed hair stylist. For instance, most cosmetology schools and beauty schools offer training programs that last between nine months and two years. It’s also common for community colleges to offer programs in hair styling and cosmetology. Successful completion of one of those programs will earn you both an Associate’s Degree and a hairdresser license. The courses you’ll take may involve hair cutting, hair coloring, hair styling, skin care, and even salon management. After completing the training program or earning your Associate’s degree, you’ll have the opportunity to earn your hair stylist license and hit the job market. If you’re wondering can you style hair without a license, the answer is no. All 50 states require a hairdressing license in order to work as a professional hair stylist. Of course, the requirements vary by state. In many states, hair stylists must be at least 18 years old. Meanwhile, other states allow hair stylists to receive their license as early as age 16. Most states also require a hairdresser to have either a high school diploma or a GED. As mentioned, the first step in how to get a hairdresser license is completing a program at a trade school or community college. It’s important to keep in mind that the program has to be approved by the state where you want to work. Most states also require a specific number of hours of training before you can be licensed. Each state will be different, but you can expect to receive at least 1,000 hours of training before you’re ready to get your license. After completing the program and accumulating the number of hours of training required by a particular state, you will be able to take a state licensing exam. The exact nature of the exam will vary state by state. However, the exam will most likely be a combination of a written test and a practical assessment. You may also wish to pursue an additional certificate in order to braid hair. Some states don’t require a license in order to braid hair, while others will allow you to do it if you have a cosmetology license. However, there are nearly a dozen states that require a special hair braiding license. Like any other form of education, enrolling in a hair stylist program will require a financial investment on your end. The average cost of an accredited training program is usually between $5,000 and $15,000. However, top-of-the-line programs may cost closer to $20,000. However, if you take your training seriously, you should have enough training hours and be well prepared to take your hair stylist license exam at the conclusion of the program. Also, keep in mind that the cost of the licensing exam will likely be in the range of $75 to $125. It’s also important to remember that you’ll need to renew your license, usually every year or two depending on the state. The cost to renew your hair stylist license is usually less than $100, but it could be more if your license has expired. If you allow your license to expire, you won’t be allowed to work and you may need to re-take the licensing exam. 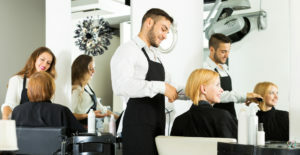 Once you are a licensed hair stylist, your career path will depend on whether you want to open your own salon and be a small business owner or whether you’d prefer to work in a salon and focus your efforts on styling hair. The former will require an extensive business plan, not to mention plenty of financing. The latter may require you to rent out space in an existing salon while trying to build a base of loyal customers. Either way, it’s important not to overlook the importance of hair stylist insurance. Most hairdressers will have general liability insurance, professional liability insurance, and product insurance. General liability will provide protection if a customer is injured at the salon. Most salons will ask for their hairdressers to have this kind of insurance before renting space to them. Professional liability insurance, on the other hand, will protect you if a client accuses you of negligence or failing to do your job properly. Finally, product insurance provides protection in the event a client has an allergy or adverse reaction to a product you use. Being a hairdresser involves working with chemicals, scissors, and other tools that can hurt someone if they’re not used properly. This is why it’s usually best for hair stylists to be protected with adequate insurance. It’s also the primary reason why hair stylists need to be properly licensed before they can begin their career.